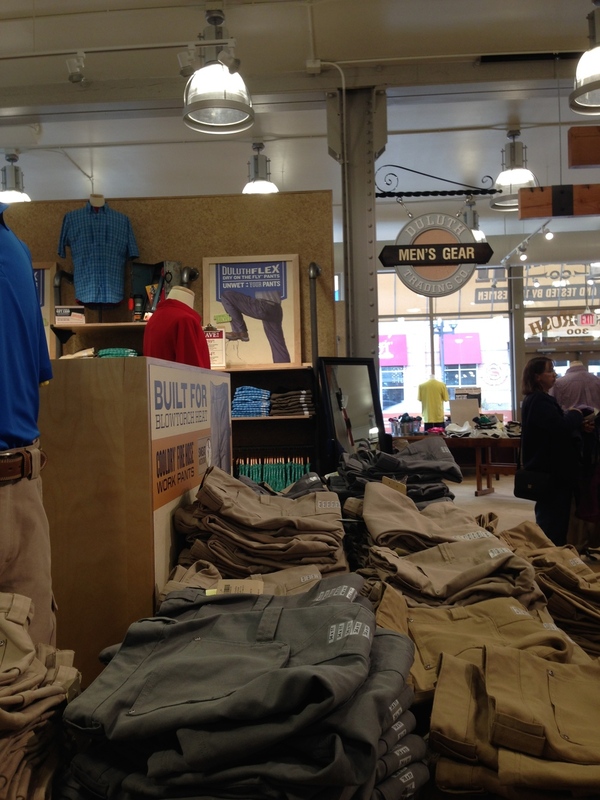 PROJECT REVIEW: Duluth Trading Co.
Duluth. The company that bears our city's name in their own name has finally returned to their roots. On May 9th, Duluth Trading Co. marked the opening of the company's fifth and newest location in the Woodrush Building at 300 E. Superior Street (across from the Sheraton Hotel). We stopped by to witness in person the store that seems to be the talk of mail order catalogue household; whether that be the household of a tradesman, tradeswoman, or your everyday Joe and Jodette. Now, we know a good deal about Duluth Trading Co. and their history. We also know a good deal about their expansion plans and their overall operations as a company. What we didn't know was just how well built their stores are. Honestly, the downtown Duluth store is absolutely beautiful. It's rustic with a taste of north woods design... and if you're from up north, you completely just understood the design reference we just made.Entering the store, one will see that it's filled to the brim with everything and anything one could desire from Duluth Trading Co. Really, there's a lot of items so give yourself a chunk of time to explore. From t-shirts to shorts, gardening gloves to overalls, it's all there. There's also no shortage of footwear, especially those Wild Boar Mocs, tradesmen gear and workshop materials. If you feel like all the shopping and product gazing is starting to where you out, then you're in luck. There's a really nice lounge area complete with a flat screen TV, free coffee, and even two computers to complete online orders through. So take a break... rest... rejuivante... and then begin phase two of shopping. In store you'll find lots and lots of wood, industrial styled lighting, and tons of those great Duluth Trading Co. graphics covering the walls, still hand-drawn as they have been for the past 20 years by the one and only Rick Kollath. After all, Duluth Trading Co's advertising is one of the things that has caused the company to become so well known and one of the things that truly sets them apart from the rest. 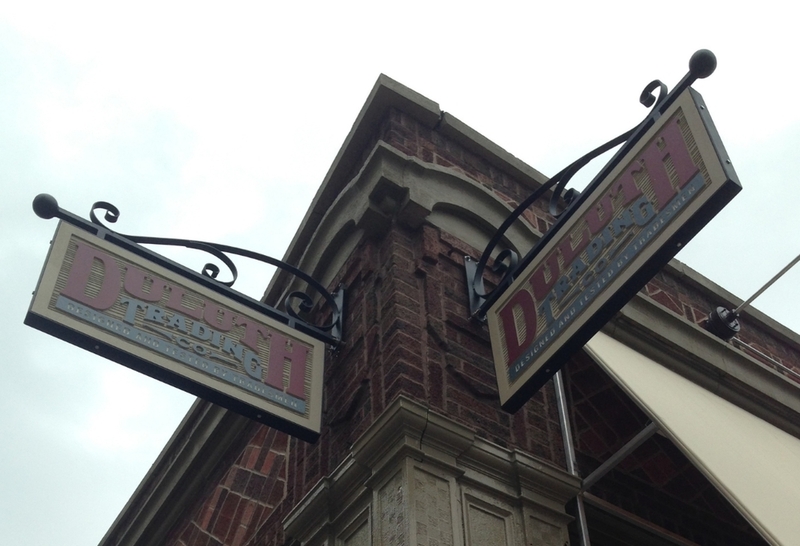 One design feature that caught our eye from the moment we walked in was the great vintage looking "Duluth Trading Co." sign in the very back of the store, a design element we think was a very wise investment. The walls feature exposed brick, while the floors feature large wooden planks. It's a shining retail gem on Superior Street. A place we hope begins a new retail development surge on that end of Downtown. 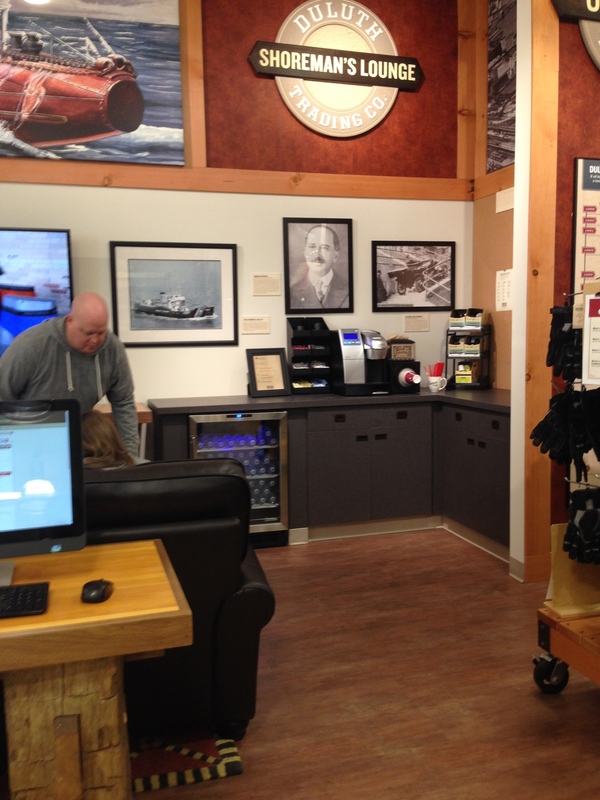 What's the one thing that we really took away from our visit to Duluth Trading Co? The sales associates. They were out in the masses and were helpful as can be. Not only did they know their products like the back of their tradesmen (and women) hands, but they were also cheerful and excited to be there. There's nothing better than a positive shopping environment where there are people who not only want to be at work, but also love their job. 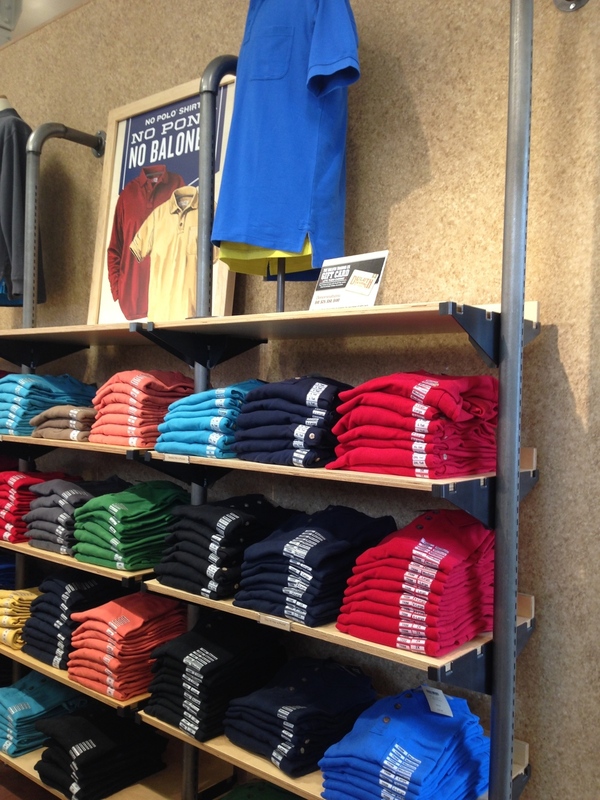 If you haven't had a chance to check out Duluth Trading Co's newest location in Downtown Duluth yet, we suggest you get on that. There's free parking in the First Street Ramp behind the Sheraton Hotel (make sure you bring your ticket for validation), not to mention on street parking. Our last words. Well done Duluth Trading Co. and welcome home. And yes, of course we made a purchase.